The biggest name in rock circles, or at least the one causing the most commotion to date in 1949, was undoubtedly Big Jay McNeely. Oh I know he only had two national hits to his credit, though one topped the charts, and he wouldn’t have any more to follow that either for another decade, but that didn’t mean his impact was limited to just those two records, nor was about the come to an underwhelming conclusion any time soon. No, not in the least, for wherever you looked the excitement that Big Jay McNeely generated, both on record and increasingly on stage, were what was coming to epitomize rock ‘n’ roll in the late 1940’s, a sense of shared bedlam awaiting those who partook in this musical thrill ride and the all encompassing exuberance artists and audiences shared when they gave themselves over freely to this type of stimulus. Unlike Wynonie Harris, who was 1948’s poster boy of rock and to this day remains the dictionary’s primary entry under the word “cocky”, McNeely seemed to represent a more well-adjusted worldview that’s often the special province of youth. Someone who didn’t have any doubts about their abilities, nor any hesitation to show those abilities off when called upon, but at the same time someone who was SO good he didn’t feel the need to flaunt it at every opportunity, thereby avoiding a frequent misstep that those who are super-cocky never seem to understand… that being so brash and self-aggrandizing is really only letting the world know how insecure you are underneath the bravado. McNeely never had to worry about that affliction. His records spoke for themselves, as did the clamor by record companies to sign him up, and even when his commercial fortunes couldn’t quite live up to the high expectations set by his spectacular early success on the charts, he’d always remain the most sought after tenor sax headliner in rock because of the prodigious musical gifts and personal magnetism he brought to the table. The releases of McNeely to date under his own name have been housed by two record labels, Savoy from Newark, New Jersey and Exclusive located in Jay’s hometown of Los Angeles, California. You couldn’t get much farther apart and still be on mainland American soil than those two locales, which shows the scope of his appeal in a style that was still – at least somewhat – provincial by nature. He’d first come to the attention of Otis by competing in, and blowing away the competition, at amateur nights held in Johnny Otis’s Barrelhouse Club just a block away from where he lived and Johnny quickly signed the kid up to appear in his own top notch band. While at the club stirring up a storm with his tenor sax he was spotted by Savoy’s West Coast A&R director Ralph Bass who was so impressed he had Savoy’s owner Herman Lubinsky fly across country – which in the last days of 1948 was still a fairly big deal – to see him and sign him to a contract personally. Though Lubinsky was wise enough to bestow the Big Jay moniker on the kid born Cecil McNeely, he wasn’t so wise as to sign him to a longer term deal and so Savoy had just two sessions with him, resulting in eight sides. When the first two releases both hit the charts, with The Deacon’s Hop hitting number one which pulled Wild Wig into the listings as well, McNeely was the hottest name in rock. Because he’d worked behind Otis at the same time he also appeared on sides issued by Excelsior Records, where Johnny was currently enlisted. When Big Jay’s solo stuff on Savoy started making noise Excelsior smartly re-issued Otis’s Barrelhouse Stomp with an amended artist credit to read Big Jay McNeely with Johnny Otis’s Orchestra! Savoy though was the label who’d gotten the actual chart hits with him and that should’ve put them in a position to hold onto him, or at least provide more incentive by recycling the money earned by those hits into signing him to a longer contract, or at the very least using the status that came with Billboard confirmation of those sales to entice him into sticking with them because they were the ones who had the national network of radio contacts, record distributors and promotion men, as well as the name recognition and respect for their label to keep getting him future hits. But Lubinsky was a hot-headed cheapskate and when Jay balked at an extended stint playing New York because he wouldn’t be allowed to bring his own band (a decision likely insisted upon by the powers that be in order to save expenses for Savoy or the promoters) after being warned by other musicians who’d been through the ringer how acts were ripped off financially by those making the deals, he promptly found himself being yelled at for his impudence! In swooped Exclusive Records (owned by Leon Rene whose brother Otis owned Excelsior where Jay had played behind Johnny Otis… maybe you should take notes, there’ll be a test on all of this later) who signed him up with a beaming smile, leaving Lubinsky and Savoy holding the bag… and, as it turned out, holding just four more songs he’d already cut for them back in December to issue on their now departed star, Big Jay McNeely. 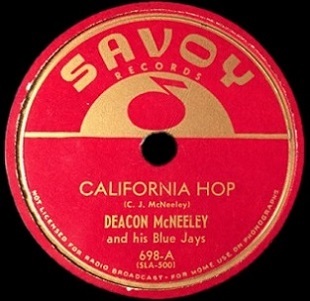 It’s ironic, since instrumentals don’t have built-in titles and therefore need to have them conceived by the record company to promote the song, that Savoy named this California Hop thereby in a way further establishing his local West Coast notoriety which could now only help Exclusive Records who had him under contract. But the term “hop” had of course also been used on The Deacon’s Hop and it referred to a popular dance at the time called The Texas Hop. I’m sure Herman would’ve liked to call it that except Pee Wee Crayton had beat him to it and scored a blues instrumental hit with that name a few months back, so “California” it was. In any event the name itself doesn’t matter much, other than as point of reference, what matters in an instrumental is the music that comes under that title and here we find McNeely with his most pedestrian of rock releases to date. California Hop starts off with a passage which sounds eerily familiar to anyone well versed in rock ‘n’ roll circa 1954, but obviously in 1949 that wouldn’t be the case. The reason is the horn refrain – played by the other horns, minus Jay – that kicks this off is the same melody that Bill Haley would adapt for A.B.C. Boogie, except Haley carried that melody vocally, not instrumentally. At the risk of getting ahead of ourselves it was equally tame then as it comes off sounding here. But of course as we should know by now we can’t judge Big Jay McNeely records until Big Jay McNeely himself makes his presence known and when he comes in the pieces start to fit a little better. Better, but still not great, because he is merely a supporting role for that main melodic refrain his bandmates play. The featured support, make no mistake about it, but unlike most of his records he never fully takes this over and claims it for himself. His playing is fine, but he merely winds his way around the main trunk of the song like a bittersweet vine reaching for the sky, and while eventually he gets into the sunlight with a few decent displays he’s not really stamping this with his personality. It could be anybody playing this, Hal Singer, Wild Bill Moore, Eddie Chamblee, you name ‘em. All good players, yet none quite as distinctive as Big Jay McNeely and that’s the problem. You’ve come to hear McNeely’s particular style and while that style certainly isn’t beholden to any one thing, he’s usually got a forceful tone and melodic sensibility that are both in somewhat short supply here. This is paint by numbers sax, not a impressionist painting that we’ve come to expect – even at this early stage – out of someone with his skill set. When we look at the session info we get a little more insight as to why perhaps this one is not quite clicking. Jay’s older brother Bob was his long-time running mate in the band yet he skipped that session altogether, annoyed that it was his younger sibling getting the accolades when he, Bob, was the one who’d started Jay (or Cecil as he was known as then) playing in the first place, giving his little brother his saxophone when he went into the Army. The falling out wound up being only temporary – the end of their brief estrangement brought about perhaps when Bob saw Jay score huge even without him on The Deacon’s Hop and realizing he’d better jump back on board or be left behind altogether – but without him to carry the heavy load on California Hop there’s a huge hole that doesn’t get filled. I suppose if Bob wanted to make his case for his value early on this did just that, showing one and all just how vital the elder McNeely was to the group’s sound. Though they were able to compensate for his absence on The Deacon’s Hop by having a trombone take its place and putting it to use on a great churning riff, here they attempt the same thing but on a weaker part. The only horn that plays with any heft is Jay’s tenor, the others are occupying the higher range and while they deliver their parts enthusiastically there’s no way to build around that in a way that leads to any anticipation. They start off up high, they stay up high, they wind up just as high, the view never changes. When ranking the greatest tenor sax players in rock’s seventy years Big Jay McNeely may only take a back seat to King Curtis, maybe one or two others who specialized in sessions, and that’s pretty rarefied air. But Bob McNeely may actually rank highest amongst those who were baritone sax players exclusively. Red Tyler from New Orleans and Mike Terry at Motown might dispute that, and certainly they’ve got more solos on record to bolster their claim for the number one spot, but it’s hard to think of anybody else who manned the lowest register in the horn section with more consistent might than Bob McNeely. When he’s not around his absence is notable and in this case, for the first time with Big Jay, his absence is fatal to the song’s prospects as well. The record’s lack of success comparable to their first two releases with him might’ve actually made his departure a little easier for Savoy to take, even as they would’ve undoubtedly liked a bigger hit to line their own pockets a little more as a going away present. The fact that Big Jay’s national hit-making run was all but over may also have given Savoy a sense of satisfaction, or perhaps allowed them to falsely claim prescience in their judgment, correctly predicting his balls to the wall style couldn’t possibly keep pulling in the same returns each time out. The problem with that theory is his approach actually continued to work quite well thank you very much. First off this record DID chart, albeit on the Cash Box regional listings only (it went Top Five in Cleveland for instance), as did many of his other records to come, as that magazine was far more focused on outlets which sold these types of records than Billboard’s more mainstream surveys of record stores and jukebox locales. More than is even reflected by chart numbers though McNeely remained a fixture in the rock starting line up for years and was one of its most consistent live draws, a guaranteed wild show that you just had to experience. This one doesn’t quite live up to that reputation. Where California Hop fell short is it wasn’t arousing enough to satisfy those who had already come to expect a heart-attack inducing track from Jay each time out, or for that matter a more complex arrangement and better melodic structure. But this was an anomaly, not a warning sign that his time was soon up. As the weakest of his initial tracks you could rightly call this a throwaway or album filler in another era, but given the circumstances Savoy had no choice but to issue it as one of the remaining sides they had from the artist who’d given them so much in so little time. Whether they were grateful for those first two singles or resentful for the abrupt way their deal came to an end may never be truly known, but what is known is that both sides benefitted greatly for the short-lived partnership and as the saying goes, everything ends badly, otherwise it wouldn’t end. This isn’t quite bad, just underwhelming, and this isn’t quite the end either, as the flip side still will have something to say about all this as will the last record of Jay’s from the Savoy vaults in the future. Besides, in the big picture of things Big Jay McNeely is only just getting started and so consider this just a brief hiccup in an otherwise long and rewarding career. Leave a reply on "Big Jay McNeely: “California Hop”"